I pride myself in creating products the most “natural” way that I can, like using fresh tomatoes instead of canned, fresh herbs (preferably grown in my garden) than dried, etc. But oddly, I also have preferences for using processed items like the beans in my chili, and a penchant for eating (super) processed foods like corned beef. 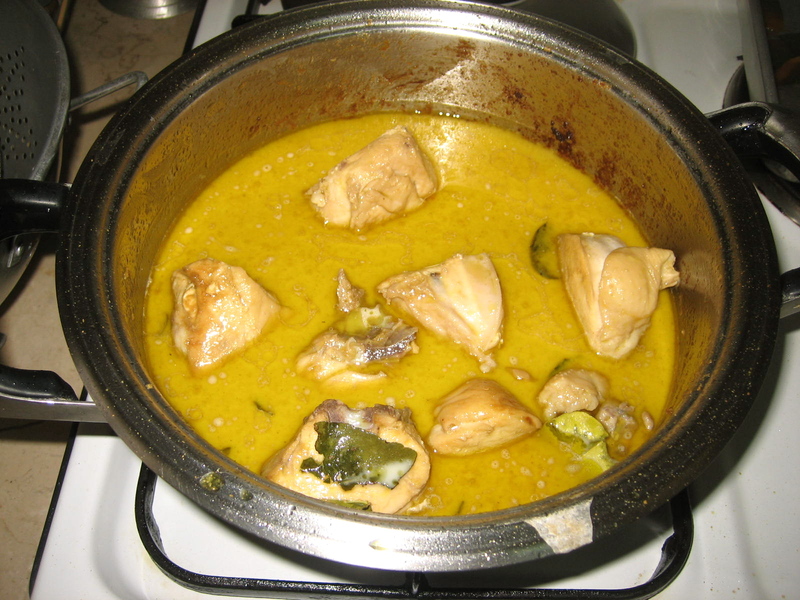 But when a package of pre-mixed item is given to me (usually from the US), I don’t hesitate in cooking up a batch. At least this is one way of me being able to taste something how it really is supposed to taste, besides my (sometimes gnarly) experiments. Thai kit from Chel from Thailand! 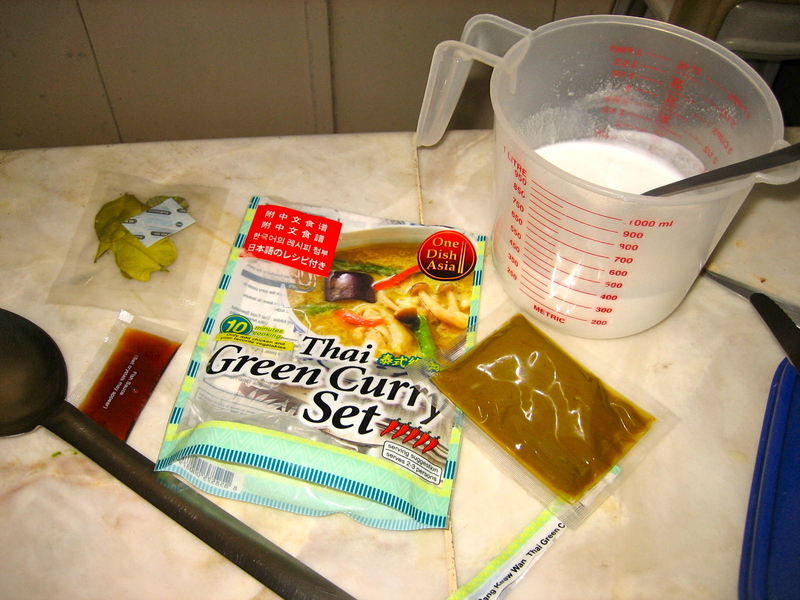 A friend of mine just got back from Thailand and got me some good ol’ green curry kit. I got excited because I love curry. My mom hates the ones I have cooked in the past. So at least, the kit assured me of some great cooking. 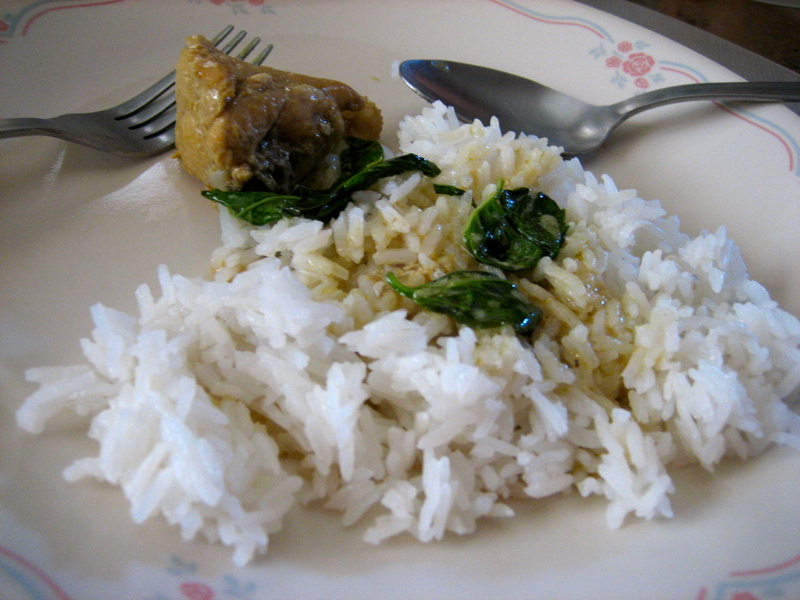 Inside were dried kaffir leaves, coconut milk powder, the curry paste, and fish sauce. I just had to provide the chicken (1 big breast), and vegetables (1 eggplant, some bell pepper, and lots of basil leaves). I wasn’t reading the packets very well and mistook one pack of the fish sauce for oil (I thought it was provided for) and ended up stinking the whole kitchen. Mistake number two was using the wrong pan. Mistake number three could have been the frozen chicken breast that I used. The instructions were quite easy. 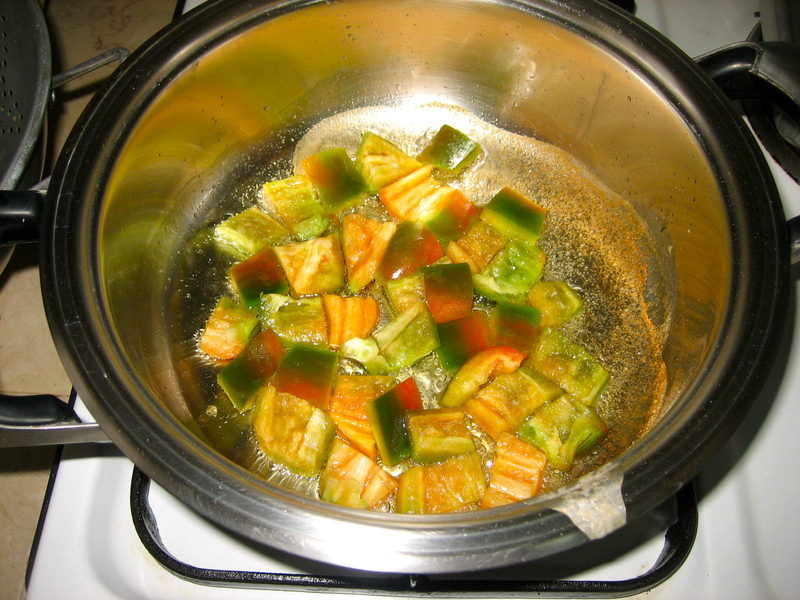 Saute paste, add chicken, add coconut powder diluted in hot water, add veggies of your choice. Serve. Sounded simple, but not if you don’t follow the instructions well enough. I used a sauce pan instead of the fast cooking woks that I was supposed to use, because I needed a decent cover for my long-cooking frozen chicken to defrost it. So that ended up with watery sauce instead of the thick, coconutty sauce it’s supposed to be. So the watery sauce hence lacked a bit in the salt department because of all the liquid left behind from the not so high heat, fast cooking style it should have been. planning to recreate it without the help of mix next time 🙂 thanks for dropping by! 🙂 thought it’ll be too hot. 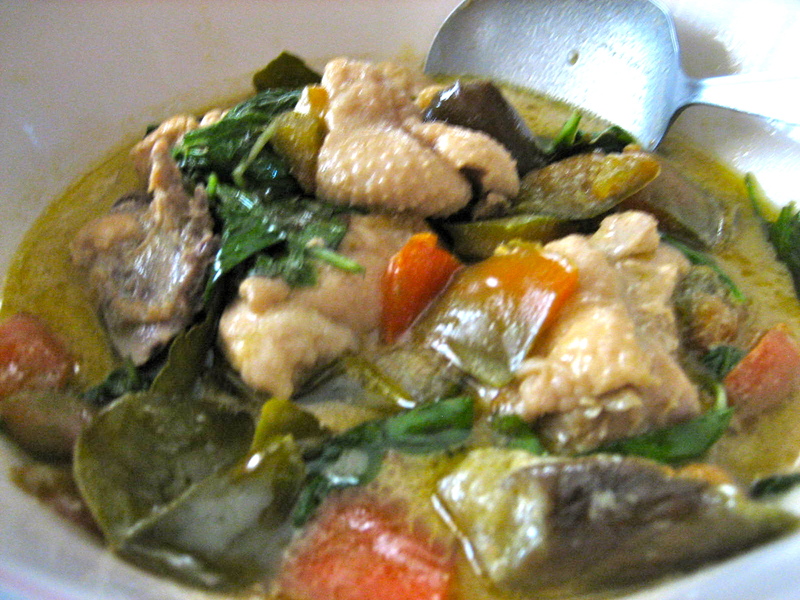 how about the tom yum?